Nicolas Steenhout (Part of a Whole) writes about the importance of transcripts for audio or video web content. I recently experienced the power of transcripts (or in this case, live captioning) when I attended The Strange Loop conference in St. Louis earlier this year. The conference organizers where very cognizant of accessibility issues. 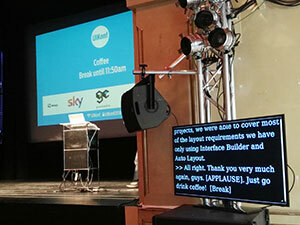 They provided accessible transportation to conference venues and offsite activities, and they provided technically qualified live captioning in the two largest rooms. Sessions that were presented in smaller rooms, while not captioned live, were video recorded, and transcripts were made available after the fact. It was very clear that the live captions benefited a large portion of the audience, including those with hearing impairments, non-native speakers, and anyone who got distracted, lost focus, or just wanted to know what the speaker said 30 seconds ago.